It said certain Moutaux wanted to carry out terror attacks because he was unhappy about mass migration. 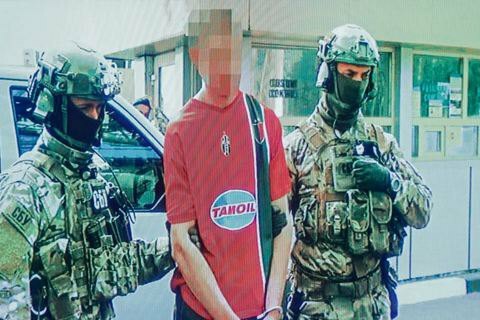 The Security Service of Ukraine (SBU) has published the excerpts of recorded conversations featuring the French national detained on suspicion of preparing terror acts during the 2016 European football championships. On the tape, the French man captioned as Moutaux speaks with some Ukrainian national. Mass media learnt that the detained is Gregoire Moutaux, 25, a farm worker, who originally comes from Bar-le-Duc, near Reims, in northeast France. The SBU also published the timeline of the operation to detain the Frenchman. He was first spotted by counterintelligence in December 2015. During his stay in eastern Ukraine, he attempted to build contacts with Ukrainian servicemen, posing as a volunteer. He spoke critically of his government's loyal policy towards migration. In April 2016, he came to Ukraine once again and tested arms and explosives while being watched by the SBU. Here he obtained five Kalashnikov rifles with 1,080 bullets per each, two anti-tank grenade launchers RPG-7 with 18 shots, 125 kg of TNT, 100 electric detonators and 20 face masks. The transfer was monitored by the SBU. He and his accomplices were planning to use the arms and explosives to set bridges and highways off in various parts of France. Other targets of terror included a public tax office, a mosque, a synagogue and public offices involved in preparations for the Euro 2016. He was also looking for people who could smuggle the arms across the Ukrainian border for a reward of 3,000 euros. Having failed to find one, he decided to do this on his own. The SBU acting in coordination with border guards detained the Frenchman at the Yahodyn checkpoint when he was trying to smuggle the arms and explosives across the border.